UntitledCurrently my studio, JHill Design, produces 2 types of design work: graphic design services (websites, logos, marketing materials and such) which is about 60% of the business and the paper line "Places I Have Never Been", which is about 40%. Last winter I decided that over the next couple years I'd like to spend less time designing logos and more time drawing patterns for the paper line. The way to go about that was to grow the business was to take it to a whoelsale level, and that ment trying out the National Stationary Show. 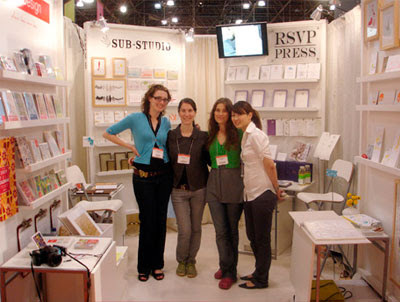 About a month ago, at the end of May, my studio participated in the National Stationary Show in New York City. The retailer-only (supposedly 15,000 come) trade show showcases the work of about 1,300 stationary lines. The booths are not cheap, the smallest booth is about $1500 and that is just for space and curtains. Carpet, electricity, walls, fixtures and lighting is all additional (not to mention traveling to and staying in NYC for a week). The thought of spending all that dough on something I had no idea what was going to be like was a little daunting to me as was setting up my own booth. So I hooked up with another stationary line, Sub-Studio, who was willing to rep my and 2 other lines and in the end we were all able to share a booth. I was SO glad we did it this way. The pressure was enough as it was (don't attempt to plan a wedding while getting ready for the stationary show) and it was great to be able to lean on others and to share expenses and resources. At the show we each had our own little wall with our logos and products, and we got many compliments on how fresh our booth looked. It was a great way to connect with retailers, press and other designers and I plan on doing it again next year. That said, I noted a few things I would do differently the next year, and was glad that I had done this small trial run. So instead of doing a "how to do the stationary show" post (paper crave has a great series about that here) i thought i'd post my "what i'd do next year that i didn't do this year" list. - Press Kit: thank god I had them cause I went through about 35 there. I would put a bit more effort into it though and include a cd of images. - Tote Bags: ingenious marketing. many booths were giving out tote bags for buyers to put all the catalogs they were collecting into. The bags were silkscreened with their logo and booth #. Talk about free marketing! - Collection: I'd think about my line and how to diversify the collections within it so that different retailers may be drawn to different collections. - Carpet: we had some white ikea hard wood floors and it looked stellar, but it was killer to stand on, i'd go for something padded next time. - Wedding + Baby: That's what many retailers wanted... I didn't have either, but I will next year! - Letterpress: Some retailers want just letterpress, but I am personally not on the letterpress bandwagon. I like using too many colors in my work and in the end I think a lot of the "letterpress for the sake of letterpress" work out there starts to look the same. So I'm sticking with off-set. - Hotels: A decent hotel with a nice bed that is quiet is worth every penny when you as tired as I was while at the show. I'm saving my pennies and forgoing the (gracious) friend's aerobed next time! 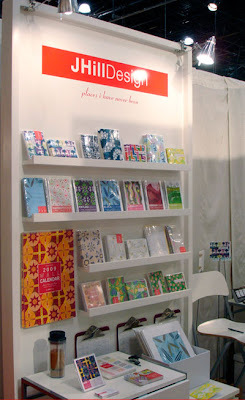 To check out some great round up photos of the show visit here: Design*Sponge, OrangeBeautiful, The Storque and Oh Joy!